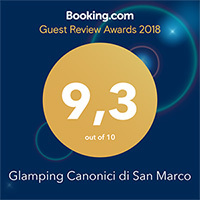 From the “ Marco Polo “ Venice airport (32 km ) and from the Treviso Canova ( 45km ) with paid taxi service on request, or by bus to the Venice Mestre railway station, and then by train to the Dolo station, where our staff will welcome you and take you to the Glamping in 5 minutes by car. Get off at the Dolo train station which is on the Venice – Padua line, you will be received by our representative who will take you to the Glamping in 5 minutes by car. On the A4 ( Milano – Venezia )at the Mirano – Dolo exit, pass the first roundabout and turn right. At the second turn left towards Scaltenigo. Continue straight until the second traffic light and turn right towards via Accoppè fratte Nr 14; after about 1 km you are going to see on the left a Barn with red walls and windows : you have arrived at the Glamping.